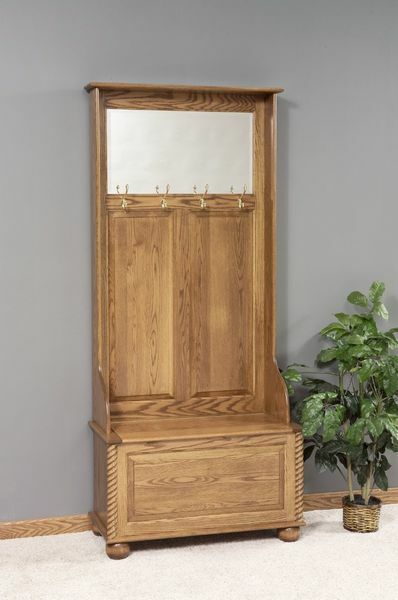 The Amish Bunn Foot Hall Storage Bench is ready to help organize your front foyer, mudroom or hallway. Gorgeous solid wood storage bench with hooks for hanging coats and bags and at the bottom? Lovely rounded bun feet! The woodworking is exceptional for this handy storage bench, with raised panels and detailed rope twists lining the sides. The Amish Bunn Foot Hall Storage Bench measures 81" high, 36" wide and 16.5" deep. Create the storage bench you're dreaming of! Select options online or contact a Furniture Specialist for assistance. Thank you for shopping with DutchCrafters!